The small tournament is beginning! Assemble a team of your best dragons, go into battle and get various prizes! To win the greatest prizes, you need to try hard! You have one week! Rewards are given for “Winning Streaks” of up to 20 victories in a row. These rewards can be earned multiple times during the course of a tournament, and usually have extra Battle Energy, Crystals, and Bonus Battle Points. After completing a Streak of 20 Wins, the streak counter is reset to 0, the Battle Points Bonus is removed, and the trainer must start accumulating wins again. Accumulated Battle Points are used to determine incremental rewards during the tournament. These rewards may consist of: Gold, Crystals, Food, Essences, Crafting Supplies, and the tournament exclusive The Armor of Shining Darkness, Chubby Dragon. Every time a trainer reaches one of these Battle Point totals, the reward is received immediately. The trainer’s overall place in the tournament is also calculated and a final prize is given based upon this placement. This final prize may consist of Gold, Crystals, Crafting Supplies, and the tournament exclusive Forest Thicket Dragon, The Armor of Light and Darkness, Phantom Dragon. 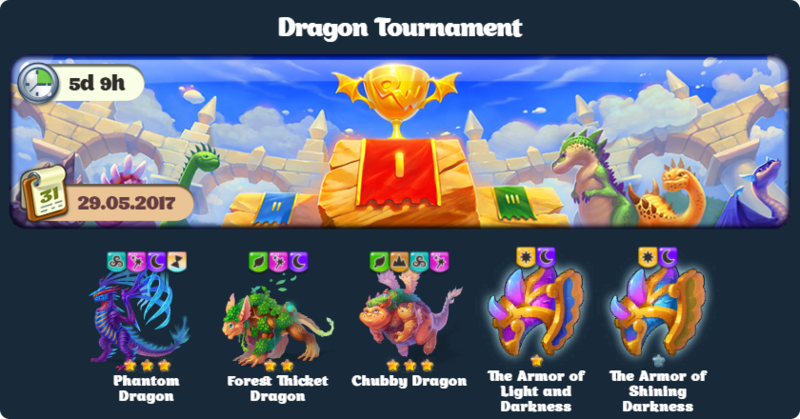 The ultimate Dragon Tournament prize is the tournament exclusive Phantom Dragon, which is only awarded to the top 15 finishers (most accumulated Battle Points) in the tournament.